It’s the BIG one and it’s BACK! 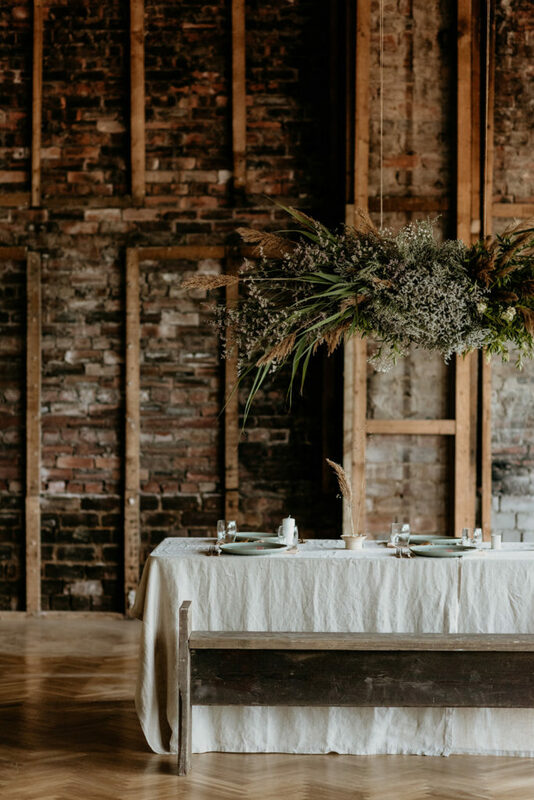 If you’re new to the world of wedding planning, are new to the utterly delicious and inspirational pages of Coco Wedding Venues or have simply stumbled across this very feature then WELCOME to the annual Coco & Kat (aka Coco Wedding Venues & Katrina Otter Weddings) collaborative Wedding Trend Report! If, on the other hand, you’ve been following us since our very first report way back in 2013 (this is our 6th trend report to date… how and when on earth did that happen?!) 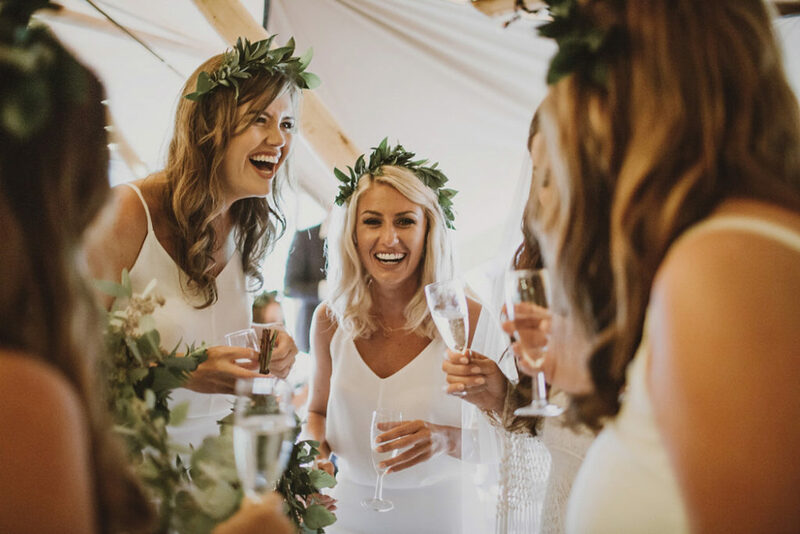 then HELLO and once again, you’re in for a mammoth trending treat with 15, yes that’s right – 15 jam packed wedding trend predictions for the year ahead! Firstly, let’s start off with a little trip down 2018 memory lane! 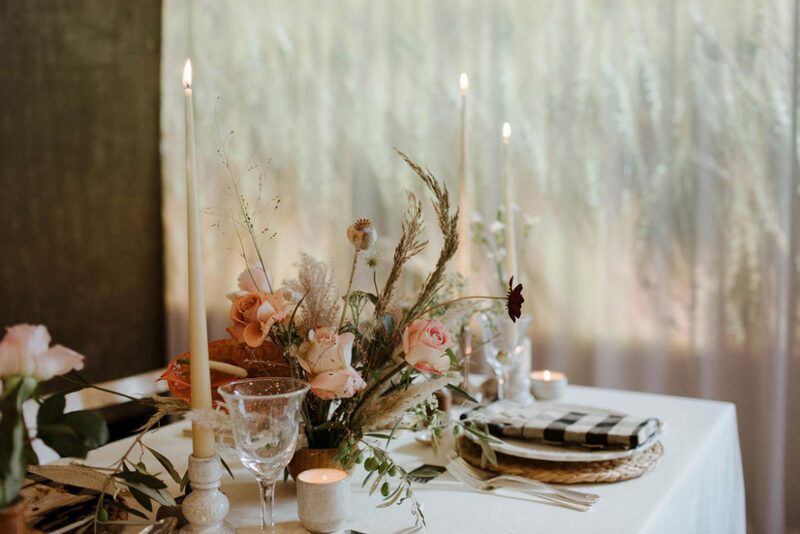 In November 2017 we unveiled our 2018 Wedding Trend Report and amongst our predictions were… velvet, clear/glass marquees, the return of gyp, small bouquets, dirty pinks and weekend weddings which have of course all been BIG news this year. And some of our predictions are set to be even bigger news for 2019 – step forward the hotly anticipated trend of intense/bright colours. So that was 2018, let’s talk 2019! Our report is merely a bit of inspirational fun with a good dose of pin-spirational pretty before the festive break. A chance to reflect and be inspired. 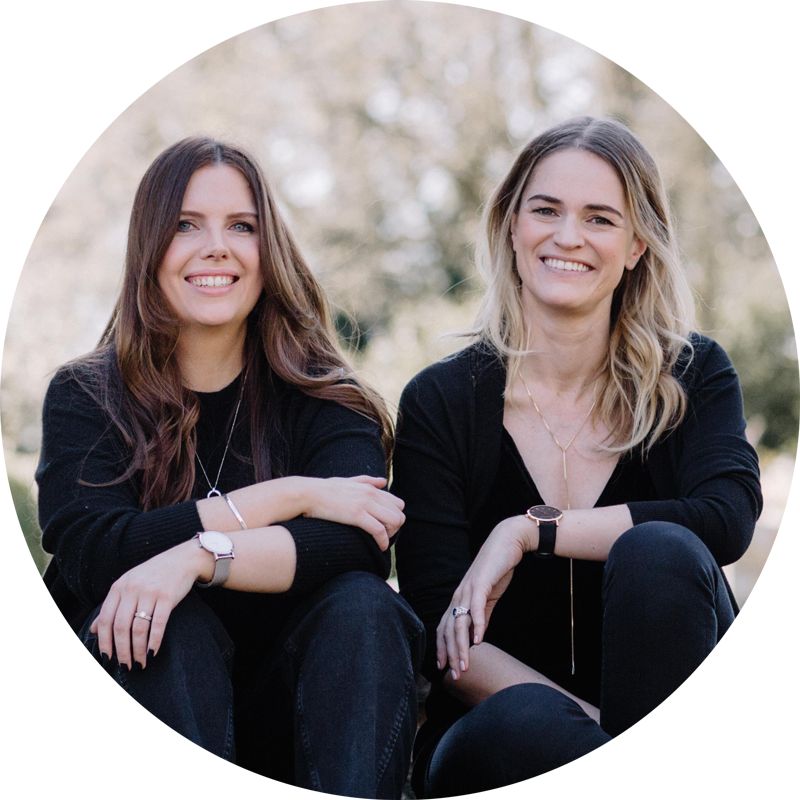 It’s an opportunity for us to sit down with a glass of bubbles and discuss the emerging trends from beautiful real weddings, inspirational styled shoots and the world of fashion (we use this as an excuse to mask our current TOAST (Mrs Hla) and ba&sh (Kat) addictions! ), design, architecture and interiors (once again to mask/fuel our obsession for all things interior design, especially the new Farrow & Ball colours). 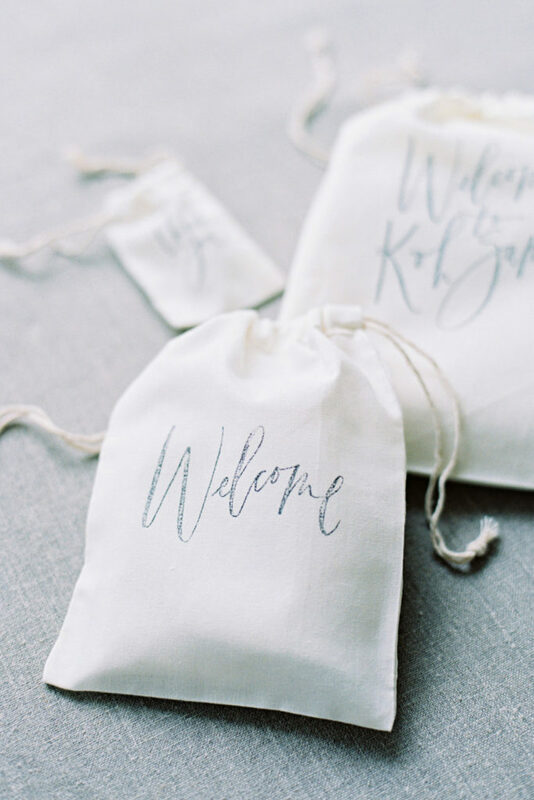 Whether you choose to incorporate our trend predictions or not, the main thing is that you create a wedding that’s truly yours and a personal reflection of you as a couple. You see, trends are just that, they’re trends (that come and quite often go) and what follows are merely our predictions. Whilst some may turn out to be BIG news, others may prove to be a little off the inspirational mark (code for too many bubbles!). The main point when planning your wedding is to have fun, be creative, be inspired and above all, create something that’s truly, fabulously and timelessly you. Annual note/caveat over and 15 trending treats coming your way! Every year we, as an industry, make a BIG deal about colour trends and colour palettes with the PANTONE colour of the year being the oracle for the year ahead. 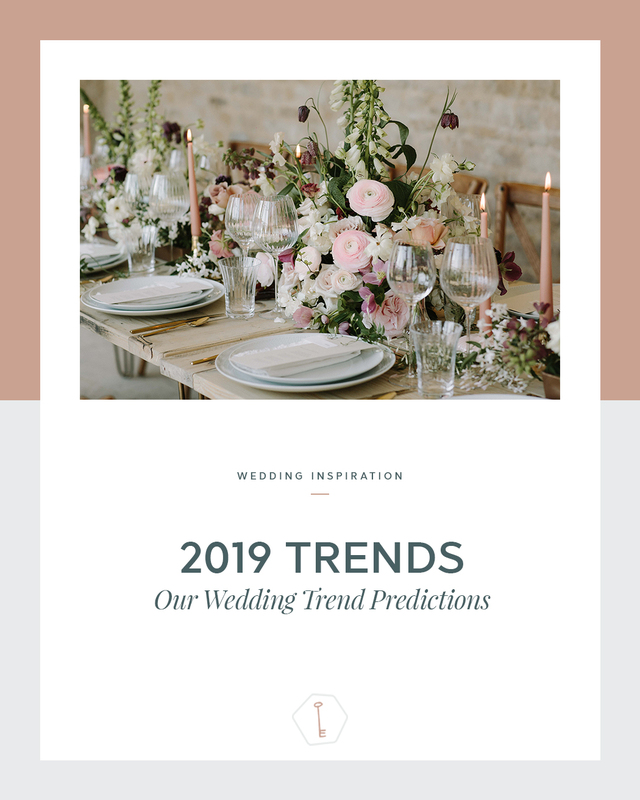 We too have, and always will have our colour predictions as part of our Wedding Trend Report and this year is no different HOWEVER, we’re also predicting that 2019 will be the year where the industry and couples alike focus more on planning weddings that permeate around the notion of a vibe or mood rather than a specific theme, colour or colour palette. I for one am thoroughly excited about this slightly more relaxed and creative outlook as it allows greater flexibility in encapsulating a couple’s style rather than pigeon-holing them into a potentially more restrictive palette. I’ll be totally honest here… favours depress me. Why? Well as a wedding planner I spend a considerable amount of time at the end of every wedding collecting favours that have been left by guests at the end of the night – whether that’s because they’ve forgotten them, they don’t want them or they simply didn’t even realise they were there in the first place and this is especially the case if they’re not edible or drinkable. A lot of time, energy, consideration and even money can go into favours and more and more couples are now realising that favours are no longer a necessary ingredient to planning a wedding. In 2019 this trend will continue with couples forgoing favours and instead allocating the money elsewhere, making more conscious decisions or charitable donations instead. 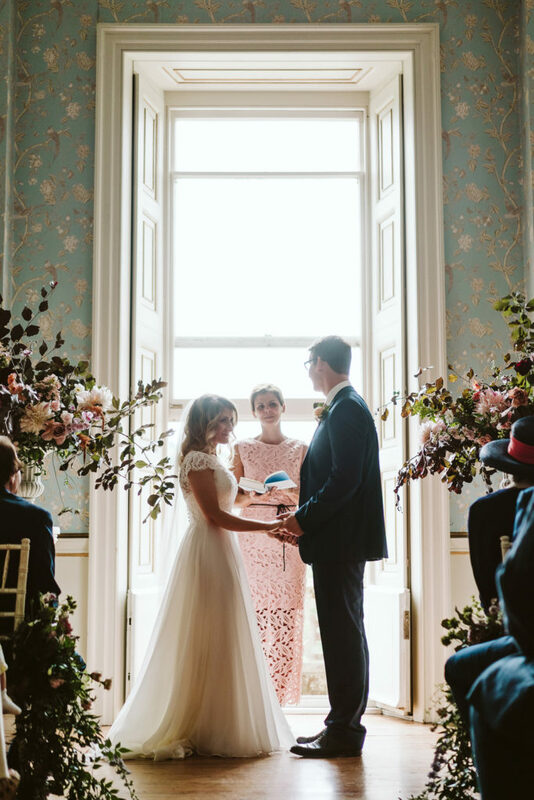 In 2017, 20% of my couples had celebrant-led ceremonies. This year the figure jumped to 40% and next year… 100%. 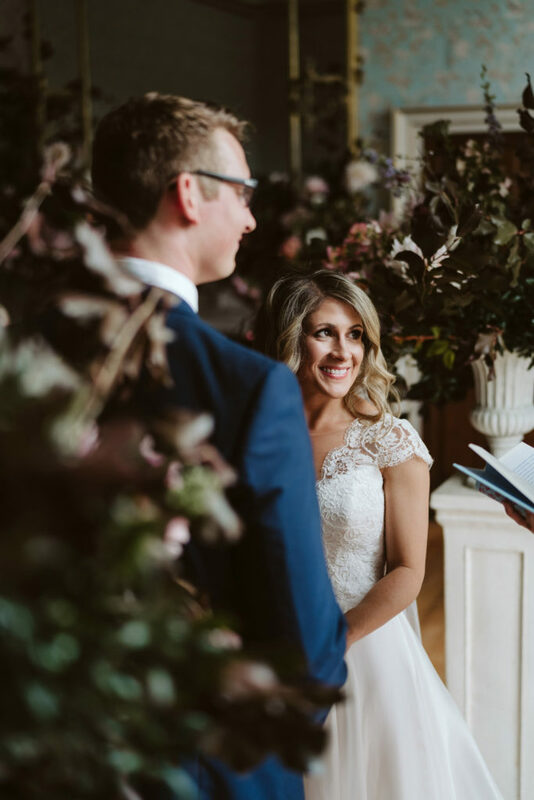 Yes, that’s right – ALL of my couples next year are forgoing legal and religious ceremonies (on the day) in favour of celebrant-led ceremonies that embrace and celebrate their unique story and individuality in a place and time of their choosing. Surely I can’t be the only one that’s seen such a sudden jump in figures and a significant change in the way couples now say, ‘I do’? And this right here, this option to say what’s in your heart and what’s important to you in a setting of your own choosing is why we’re seeing such a significant change in the way couples now say ‘I do’. As promised, our first colour prediction! And this one is fuelled by my own and current obsession for richly elegant, dramatic and intensely autumnal tones. Just think about the amount of fun that you can have with these moody hues? 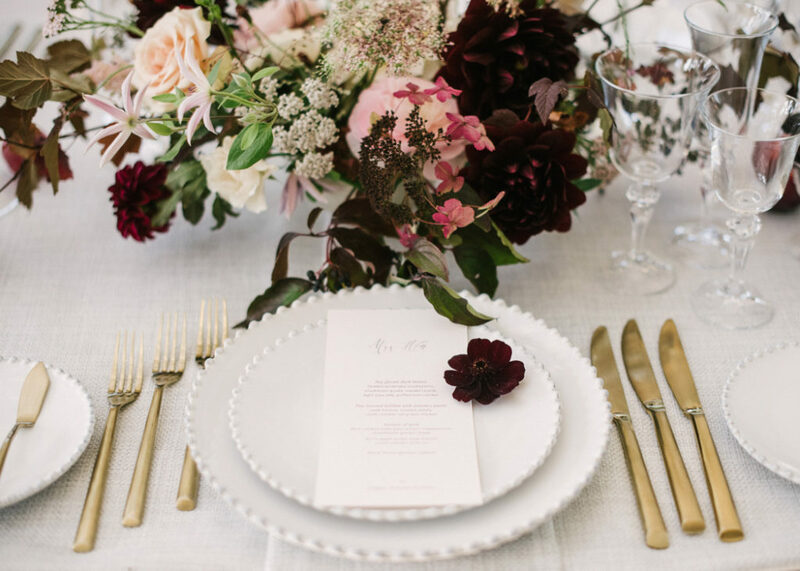 From just-bitten berry and rosy make-up to tablescapes adorned with dark plum vines, dramatic foliage, beautiful blooms and an abundance of tumbling fruit displays. Absolutely and exquisitely delicious! If ever an image personified my adoration for this colour prediction it would have to be this beaut of a bouquet courtesy of Jenni Blooms Flowers. Now for Emma’s first colour prediction – matte black. Emma spoke about this dark hue in the ‘Witching Hour’ from last year’s report and this year the trend has had a subtle makeover. 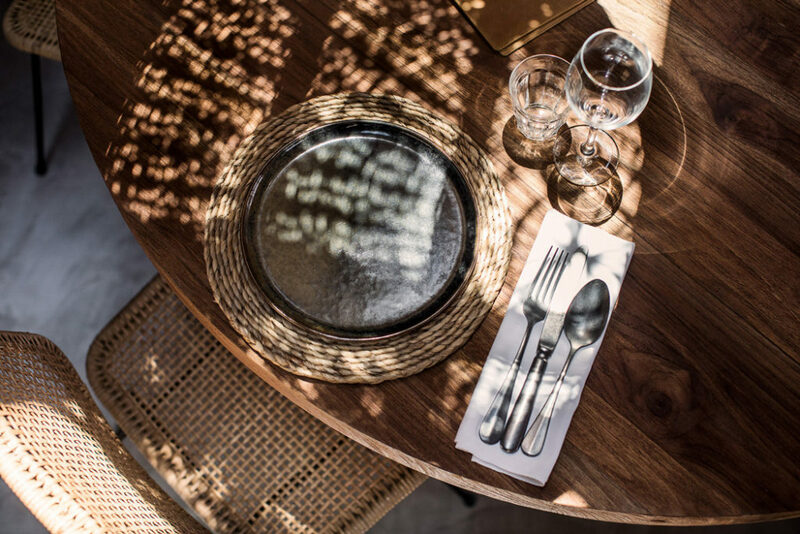 Think softened blacks and charcoals, rustic textured dinnerware, dark linens and Scandi-inspired matte black candlesticks. 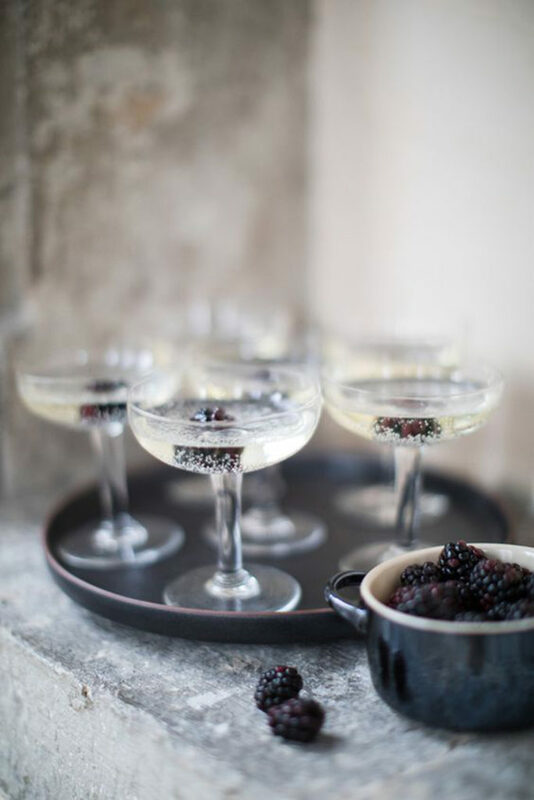 Add blackberries to your fizz and serve deliciously decadent dark chocolate puds to complete the look! 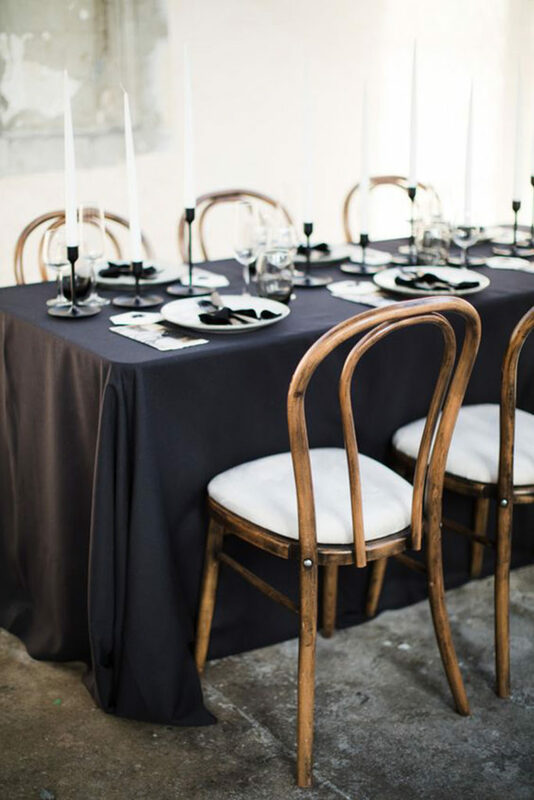 As we’ve mentioned before, black isn’t for everyone, but paired with simple wooden chairs (as seen above) and plenty of neutral florals it’s a classic palette. Throw in a black tie dress code and suddenly it’s all rather chic. If it’s still all a little bit morbid for you, then perhaps try midnight? This black-blue hue is a fabulous alternative. There’s no denying it, the wedding of Meghan Markle and Prince Harry has understandably imprinted itself on the wedding industry and will affect wedding trends for years to come and this will be especially discernible in 2019. From the dresses to the natural bridal beauty, the statement yet foam free floral and foliage installations to the Swiss meringue buttercream… to name but a few. It’s no surprise that The Meghan Effect has made it onto our list of 15. And just when we thought that was it, along came Jack Brooksbank and Princess Eugenie with her backless gown, their rich and vibrant autumnal blooms and foliages and of course their embracement and public celebration of the ‘mindful wedding’. The ‘mindful wedding’ will be a thread throughout this piece, but let’s talk a little more about foam free because we NEED to talk about it and we NEED to embrace it wholeheartedly as an industry moving forwards, so therefore this isn’t a ‘trend’ but rather something we should all take rather seriously. So, what exactly do I mean by foam free? 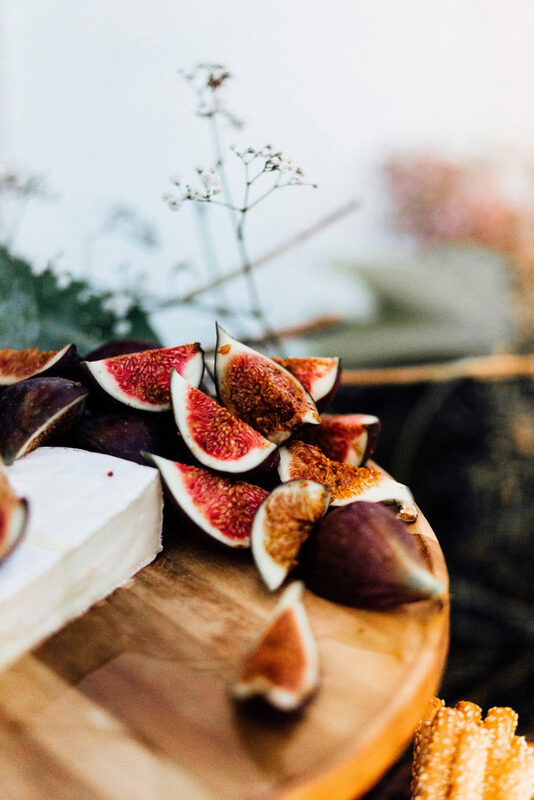 “As more of us become increasingly aware of the environmental impact of so many activities we take for granted, it’s not surprising that we are seeing a shift towards more sustainable practices within the wedding industry too. Of course, no one wants to go without on their wedding day, but more and more couples are keen to ensure that their special day does not cost the earth – literally. 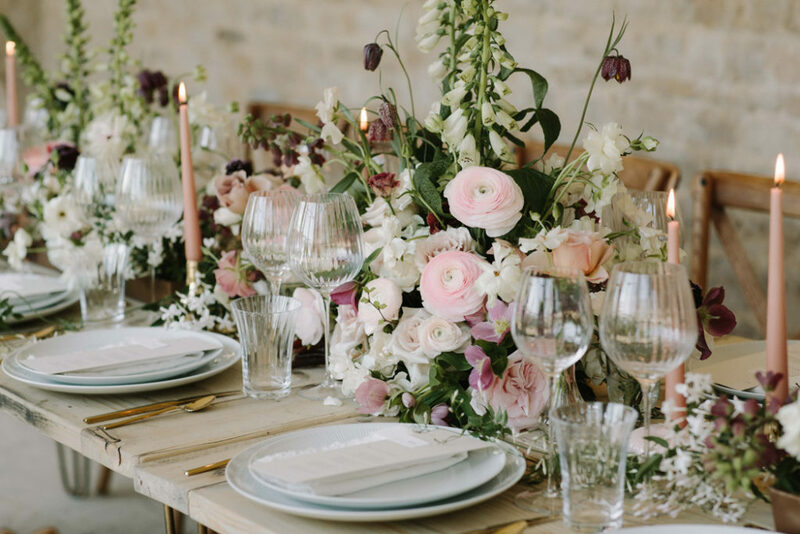 One simple way couples are doing this is by choosing a floral designer who does not use floral foam and even better, one who uses British grown seasonal flowers and plants wherever possible too. Brigitte continues “But do not despair…you can still enjoy the most spectacular and stunning floral displays on your wedding day. Many of the designs that you might covet on Pinterest can easily be recreated foam free with a few clever adaptations. You just need to find a great florist who will spend the time to devise a suitable solution to support and hydrate your flowers or suggest an equally beautiful alternative. The good news is that floral designers who are turning away from foam tend to create the most exquisite, garden style, natural florals – celebrating each individual stem rather than massed ranks of blooms. 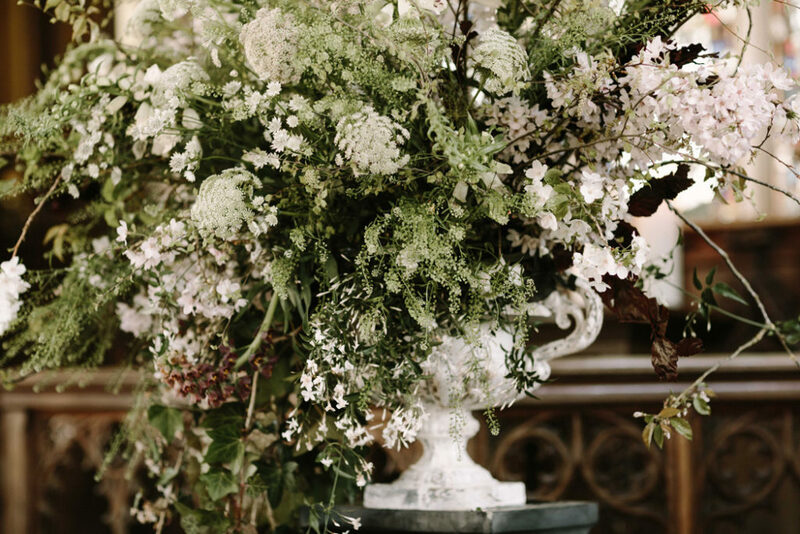 Full of scent, movement and texture and using locally sourced British grown flowers, their inspiration comes from nature and the season so creating beautifully considered pieces of delicate art with flowers. Buying British flowers, buying local and so supporting small artisan flower growing businesses will become the new normal”. Stress free, foam free, low environmental impact and did someone mention considered pieces of delicate art. 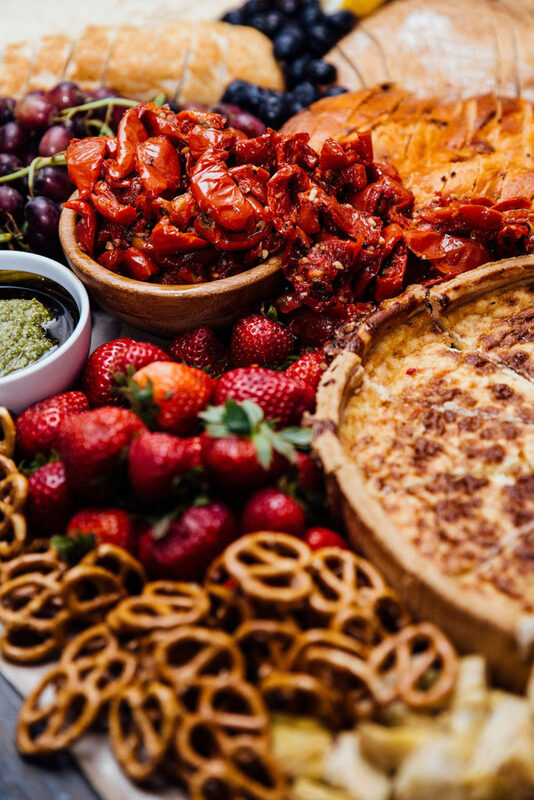 A Coco & Kat trend report wouldn’t be a trend report without mentioning food, right?! Home comforts… think next level mac ‘n’ cheese, comforting pies and the ultimate sticky toffee pudding. This trend has my name written all over it… literally! That’s because it’s my style/dress code to a T.
When it comes to weddings this can be applied to everything from the attire to the finest of details and the whole concept is this; think simple, classic, elegant, pared back/minimal, moody, sophisticated, neutral and clean. Less, well… pretty! Emma says “Throw a blazer over your shoulders or go all in and wear a suit instead of a dress as Marina London recently did for her gorgeous destination wedding! If you’re a wedding guest then take inspiration from Cara Delvingne’s recent sartorial choices. Serve masculine cocktails like an Old Fashioned or a Whiskey Sour (my fave tipple). 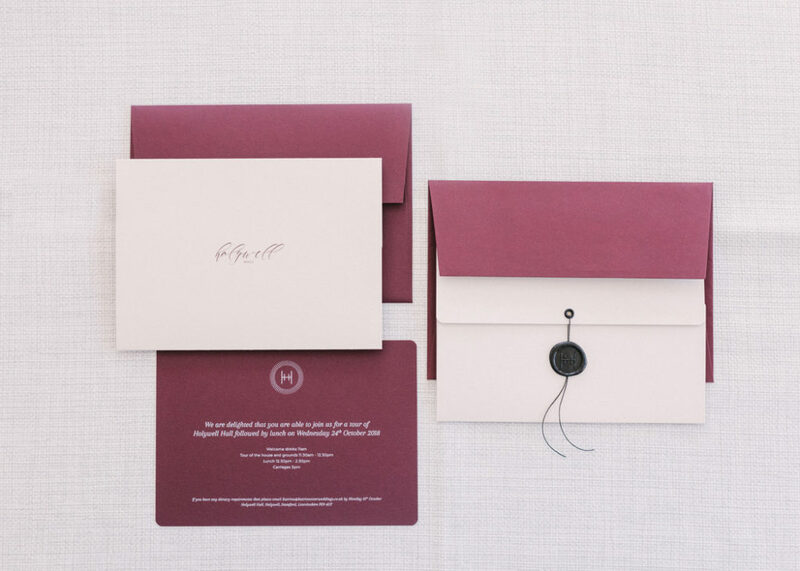 Let your stationery do the talking with simple tones and editorial typography”. Who says weddings have to be all frills and froth? Just blur those gender roles and lines all round we say. 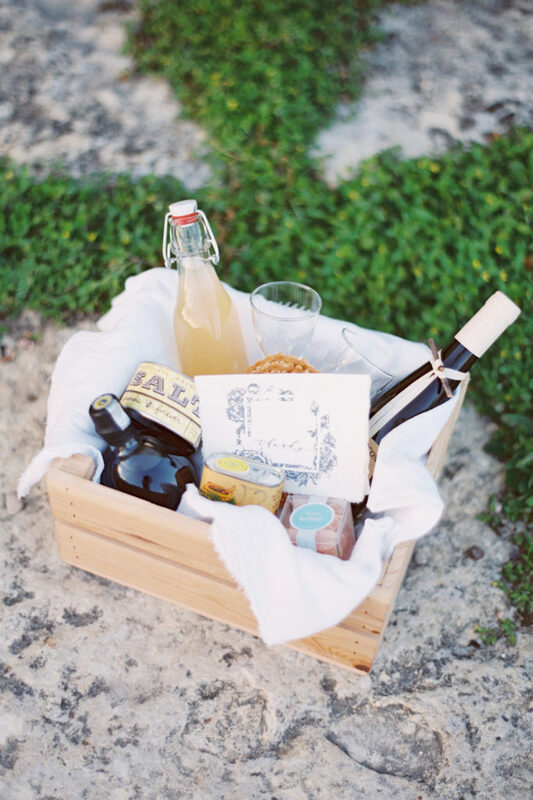 Not exactly a new thing, but certainly something that we hope to see more of at weddings! Adding moving projects to a blank canvas space will add a certain depth and immersive dimension to your dining experience, as seen here at the recent Thoroughly Modern Marriage event at ACE Hotel. 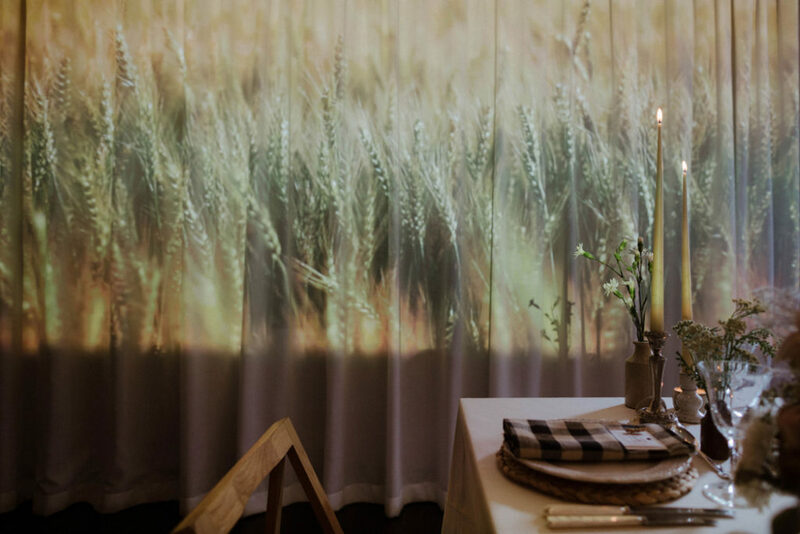 Film of swaying corn added to the autumnal picnic vibes created by Knot & Pop and gave guests a feast for the eyes. 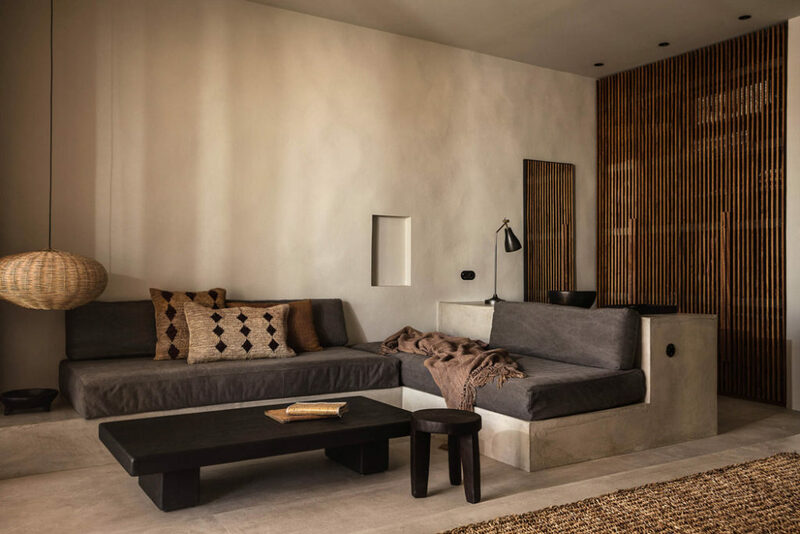 Projecting moving elements or landscapes will add add a new meaning to bringing the outside in! 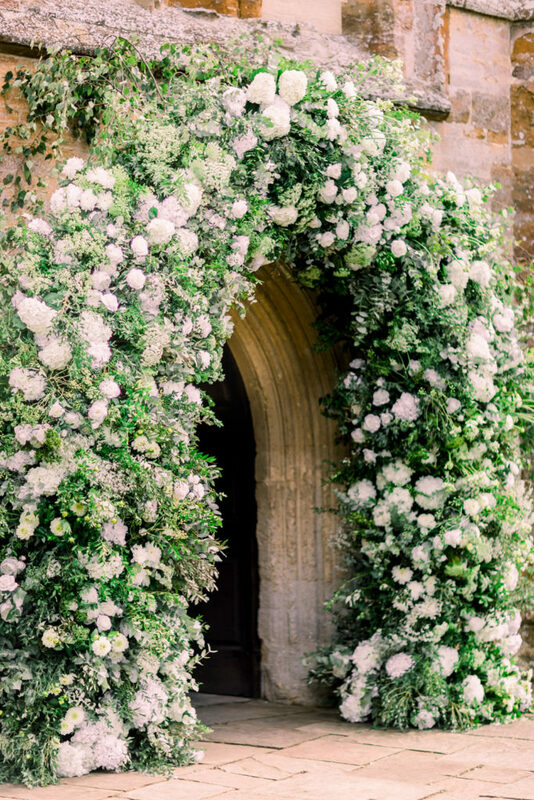 But be subtle and be inspired by the natural surroundings of your venue or the seasons. This might be the marmite one… more so than Emma resurrecting black for the second year running! Following on rather nicely from our dried flower love is the chilled-boho-gathering vibes and with this these earthy/honey tones – Emma’s final colour prediction. Earlier this year Dulux announced Spiced Honey as their Colour of the Year for 2019 and this versatile shade filled with warm and inviting tones of amber and rich caramel signals positivity, purpose and transformation. A pretty apt palette for a wedding don’t you think? This look is great whatever your hair length! 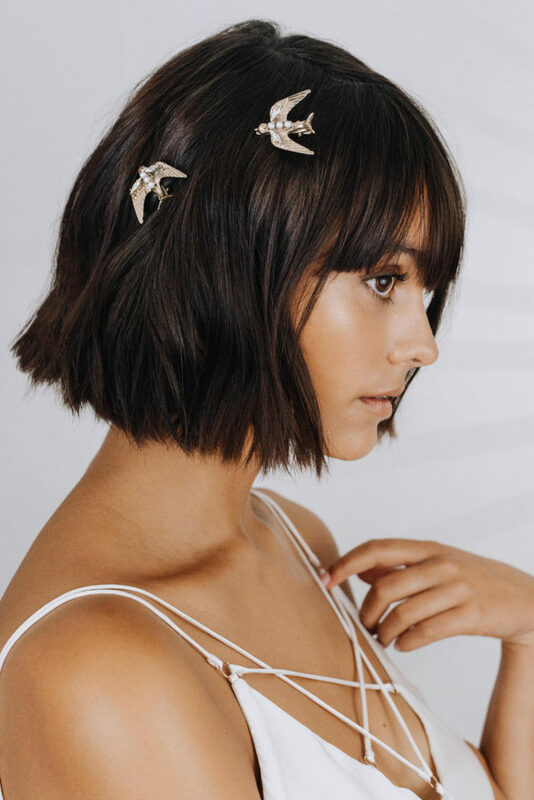 Think tousled locks and a simple slide (or three) adorning your hair – we love Tilly Thomas Lux for a spot of magpie-esque jewels. But if you still want that crown… heck go for it! Last year we championed Chinoiserie as the pattern du jour and this year we’re saying embrace the prints again! From polka dots to checks, bold florals to stripes, we’re loving them all. 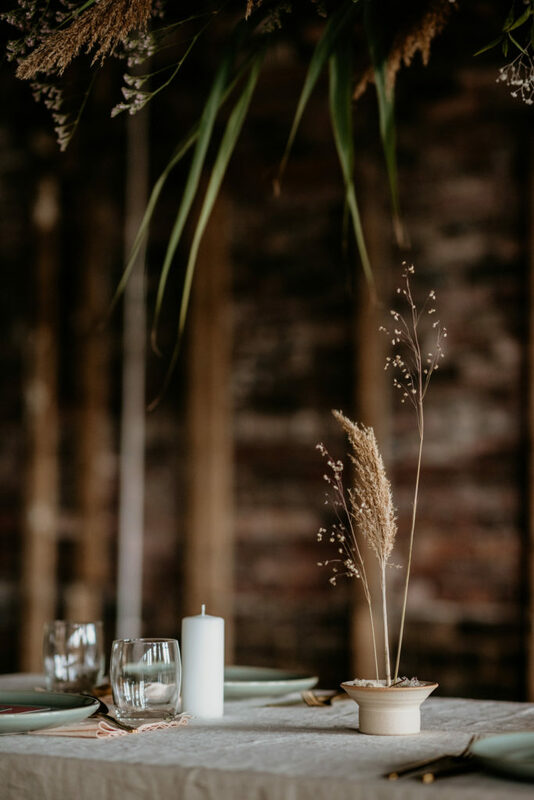 We’re smitten with the subtle detail in the napkins above at the recent Thoroughly Modern Marriage and who doesn’t love a Groom in something a little different! We think Ross looks particularly fetching in this velvet jacket with subtle gold print. This sartorial choice immediately ups the style and interest stakes! 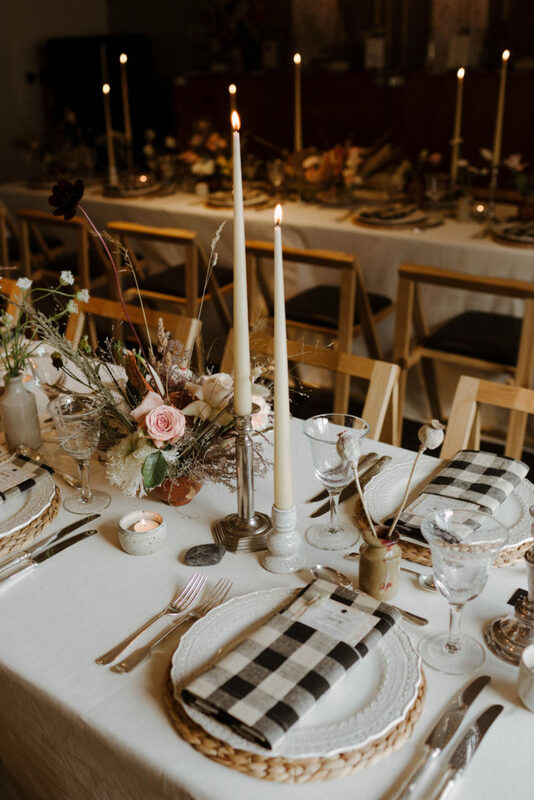 So whether you want to go bold or add subtle touches, we say experiment with pattern and texture across all elements of your wedding – stationery, tablescapes and fashion! As humans we are seeing a big shift in awareness when it comes to sustainable living in general. This is no different in the bridal industry with each Bridal Designer learning ways, adapting methods to become more ‘eco friendly’ something these days brides are aware of and believe in. From fabric sourcing to minimising packaging, each designer is trying to do their bit. Emma adds “Couples are increasingly seeking out sustainable fashion in their everyday lives (especially now thanks to Stacey Dooley’s BBC documentary highlighting the shocking facts behind the production of cotton) and so with an extravagance such as a wedding where your choices are for just one day, perhaps more brides and grooms will start embracing items they will rewear and cherish for years to come. 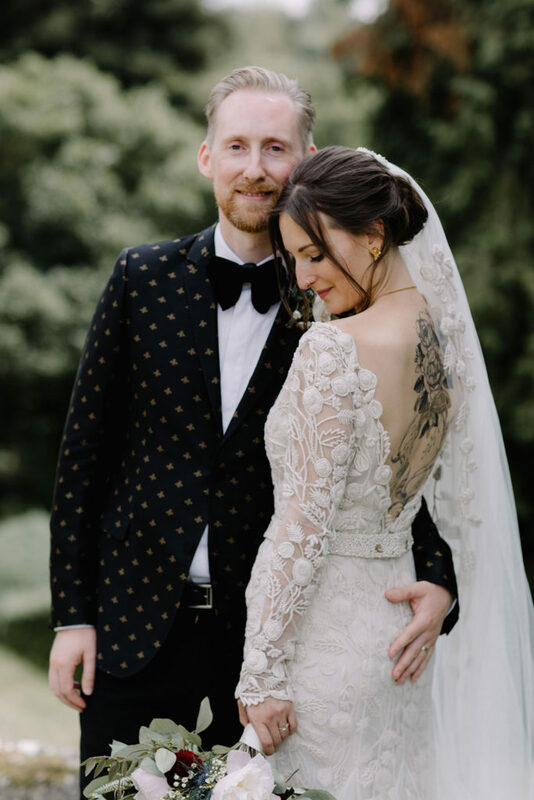 The brogue, the classic jacket, a two-piece for the bride rather than a dress and asking your bridal party to wear their best suits and frocks instead of buying new”. Everyone loves a polka dot right? And this trend is certainly emerging in the bridal scene. Charlie Brear, leading British designer has introduced this in her new Day to Night 2019 collection. It’s brave, bold and just so beautiful. Designers have ‘played’ around with colours for the past few years introducing a few into each seasons collection. The modern day bride is prepared to stand out from the crowd and move away from the traditional Ivory and I’ve certainly witnessed a shift in brides taking the plunge and ordering variations in colour from a soft pink blush, or maybe embracing a sand tone to add dept and definition. Oh and who isn’t crushing on Mandy Moore’s bridal look right now? A vision in pink and all the pampas! The ‘Who wore what’ effect. There’s no getting away from the fact that this has got to be one of the biggest game changes for the bridal industry. Female Influencers have huge followings. An audience of female consumers ready to watch, listen and engage. An audience of a similar age, going through similar life experiences. Getting married is one of them. Lydia Millen and Millie Macintosh both took Instagram by storm earlier this year wearing Kate Halfpenny – will this inspire their fans and future brides – absolutely! I talked about this last year. And the Aussie storm isn’t going anywhere. Beautifully inspiring marketing campaigns, lifestyle imagery and the laid back vibes captivates brides to be. What do you expect to see and from who? 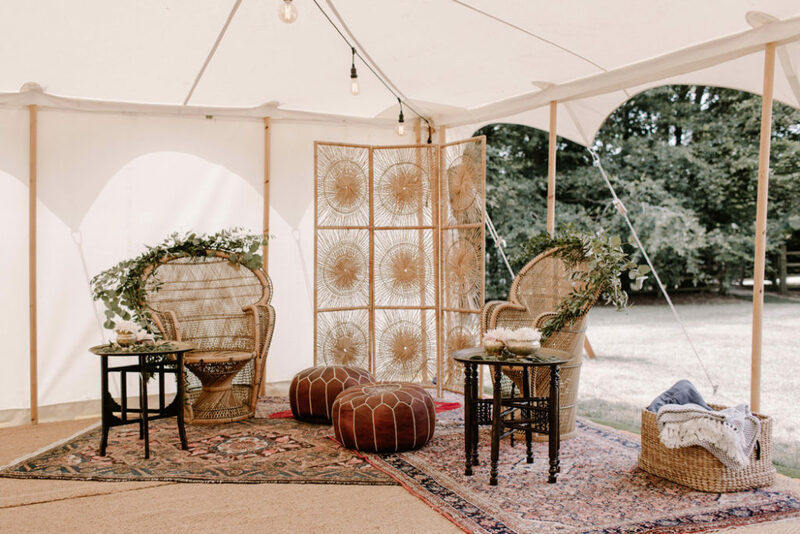 My money is on Anna Campbell channeling her new ‘Wanderlust’ collection for the modern bohemian bride, featuring exclusive embroidered fabrics, floating silks, custom-designed laces and mesmerising hand-beaded embellishment. What’s not to love. Getting more for your money – this trend isn’t going anywhere next season. Maybe we might not all be as lucky as Megan Markle having two dresses, however there are various ways of customising wedding dresses these days, it’s all about accessorising and how you style it. Mixing it up with a lace over lay or just by simply adding a gold leather belt. Perhaps you want to layer your own jacket or favourite cashmere knit over a simple silk dress – the list is endless. Our brides love thinking up new ways and adding their personality and spin on styling the final look.